Fred Goodwin, the former CEO of the Royal Bank of Scotland, illustrates the difficulties we face when we try to identify the role of people with dangerous personality disorders in contemporary events. Goodwin was CEO of RBS when it virtually collapsed in 2008, requiring the British government to step in with a £45 billion bailout. His meteoric rise, in which he was acclaimed by Forbes magazine as its Global Businessman of the Year and knighted for his services to banking, was followed by an equally rapid fall. After the crash in 2008, he was named by Newsweek magazine as the ‘world’s worst banker’ and stripped of his knighthood – joining Cambridge spy Anthony Blunt, Romania’s former dictator Nicolae Ceausescu and Zimbabwe’s Robert Mugabe as a select few to have lost their titles – after it was decided he had “brought the honours system into disrepute”. RBS was not the only British financial institution that needed rescuing at the onset of the financial crisis, but it was by far the largest and its meltdown played a major role in triggering the worst recession in the UK since the Second World War. In the UK newspapers headlines such as ‘Solid Gold Sociopath’ suggested that Goodwin suffers from a personality disorder and that this contributed to the reckless way in which he managed RBS. But can we be sure that this is the case? And even if we could, can the financial crisis really be blamed on the actions of a few pathological individuals? So let’s consider whether Fred Goodwin suffers from psychopathy or narcissistic personality disorder. First the case for the prosecution. Testimony from those who worked closely with him does suggest that Goodwin regularly displayed a lack of compassion and a tendency to belittle those who worked for him. ‘If there was an issue or a problem Fred was more interested in finding a victim and having them crucified. Goodwin also seems to have displayed the classic narcissistic traits of being unable to admit mistakes and having little tolerance for dissent. One former colleague recalls, ‘For Fred to admit that he had got something, anything, wrong, that would be incredible… He was like a little boy who never admits mistakes.’  And ‘… he is uncomfortable in front of people who know more’ ,says another. Goodwin bore grudges against those who he felt had slighted him by standing up to him. While at the Clydesdale Bank, before he joined RBS, he toured the country to meet staff and explain developments at the bank. He returned from these trips with the names of middle managers who had asked awkward questions, describing them to senior colleagues as ‘toast’. He could choose when to act aggressively and when to turn on the charm. By all accounts he was calm, polite and professional with the chairman and the board. With those who reported to him, however, his bullying behaviour meant that the smart thing for them to do was to avoid mentioning anything that might upset him for fear of becoming the victim of one of his humiliating inquisitions. One colleague recounts that it was as though he had an on/off switch by which he could move at will from cold tyrant to jovial companion. As events subsequently proved, Goodwin was a risk taker, and a reckless one at that. Risk taking is another classic psychopathic trait, but paradoxically one that can increase a corporate psychopath’s appeal. As organisational psychologist Kets de Vries points out corporate psychopaths can make exciting and inspiring bosses as they are prepared to take risks that others are not prepared to take and can therefore appear daring and courageous. Goodwin had a compelling vision to make RBS a global banking giant – a vision which also enthused many who worked with him. Now, the case for the defence. Although Goodwin was a difficult character his dealings with the RBS board were always open and transparent. They knew what he was doing and supported him at every step along the way. Also he was never involved in defrauding the bank. Another former colleague described him as ‘the world’s greatest project manager’. Crucially for our understanding of the financial crisis, however, whatever the strengths and defects of Goodwin’s personality, he did not act alone. His actions at every stage in his meteoric ascent within RBS, during which he made RBS one of the largest banks in the world, were approved not only by the RBS board, but by U.K. regulators and found praise at the highest levels within the UK government, including from Prime Minister Gordon Brown. 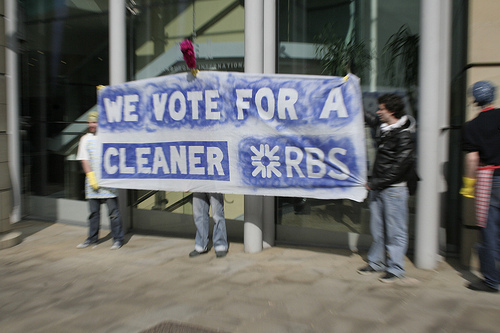 Although Goodwin himself has been silent since his removal as CEO of RBS, those friends who did not abandon him protest that he has been used by many as a scapegoat because they find it convenient to blame the whole financial crisis on one man. The truth is that we have no conclusive evidence that Fred Goodwin is a psychopath or suffers from narcissistic personality disorder. He certainly displayed certain traits that are characteristic of psychopaths and narcissists, but that does not necessarily constitute a personality disorder. Iain Martin has written that the public spirited thing for Goodwin to do would be to donate himself to the psychology department of a decent university in order that academics could run years of detailed tests. In the absence of such action on his part however we cannot assume that Goodwin is a psychopath. What’s more we don’t need to. As I have already argued, accusing this or that particular contemporary figure of psychopathology is an ultimately futile exercise since we can never decisively prove the case. Instead it is more useful to concentrate on the toxic cultures which allow such individuals to thrive. In doing so we can identify the fit between individual’s displaying pathological behaviour and toxic organisational cultures. We can identify a coalescence of like-minded people to form a critical mass capable of shifting an organisation’s values away from customer care and ethics towards pure greed and down-right treachery. And we can identify a pervasive context which skews the behaviour of many normal people towards conduct reflective of those with pathological disorders. These aspects can all be identified in the story of the 2008 financial crisis, regardless of whether Fred Goodwin is a psychopath or not. Read more on psychopaths and the financial system here. This entry was posted in Dangerous Personalities Today and tagged bank bailout, Banking, financial crisis, Fred Goodwin, global finance, Psychopaths, RBS, Royal Bank of Scotland by Ian | disorderedworld. Bookmark the permalink.